Welcome to Geo Earth Mapping! 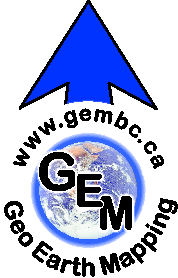 Based in Vernon, BC, we have been offering affordable, innovative, GIS/Mapping and Graphic Design solutions since 2004. Your One-Stop Shop for GIS/Mapping Services & Graphic Design. We create our products to publishing quality with follow-up service in a timely manner, satisfaction guaranteed. We believe in providing clients and customers with cost-effective deliverables, with attention to detail and accuracy, customized to the client's needs. Current GIS platform utilized is ArcGIS Desktop 10.6. We also do conversions to KML/KMZ for viewing in Google Earth ...and create geo-referenced digital data for tenure applications and PDF maps for mobile apps.